In February, in the Euro Area, companies and households have sent a positive message on their expectations. Confidence indices were up for both. The PMI/Markit index is at its highest level since June 2011 and the European Commission Consumer Confidence index has never been so high since September 2007. Two points to be noticed: constraints are not binding as strongly as they did. This is related to lower euro, lower rates and lower oil price in the Euro Area. Every economic agent has more capacity to adapt to its environment and to make arbitrage. The other issue is that uncertainty on Greece and anxiety linked to Ukraine haven’t had impact on companies and households’ behavior. The PMI/Markit index has a profile which is consistent with GDP quarterly growth and the consumer confidence index is well correlated with consumption momentum. Both indicators will be supportive for stronger growth. In other words, these two types of signal suggest that the economic situation is changing on the upside in the Euro Area. The ZEW survey for February in Germany gave the same signal.The combinationof all these indicators may show the real start of the Eurozone economic expansion. The agreement last Friday on Greece is just a way to postpone the deadline that was fixed on February 28. Greece may have 4 months to find a new deal if the arguments presented to the Eurogroup on Tuesday 24 are convincing (phone agreement by the Eurogroup expected tomorrow). But the bailout conditions have not been removed. The situation is still tight. In the USA, the industrial production index has followed a slower trend during the last couple of months (+0.06% in December and +0.18% in January). The PMI/Markit index was slightly higher (54.3) but the new orders index is stable at 54.7 and the new exports orders index is showing a slower momentum. This can probably linked to the dollar strength. Since last week and referring to the meeting that was held on January 22, the ECB now publish minutes of its council. It will be interesting to follow the evolution of the balance of strength between meeting’s members. The inflation rate in France was -0.4% in January – Close to deflation as the contribution of the index ex energy was just 0.2%. It’s clearly not enough. What will happen this coming week? The main point this week will be Janet Yellen testimony at the Congress. It will be on Tuesday 24 (and repeated on 25). We expect insights on the Fed’s monetary policy during the Q&A session. According to a lot of media, it seems that Greece will present, on Thursday, a new plan for a loan extension. Greece continues to reject a bailout extension process. That was the reason of the two unsuccessful meetings on February the 11 and the 16. The discussion is not easy as they play a kind of “game of chicken” where none wants to be the first to step aside. In this game, each of the negotiators has his own targets. For the Eurogroup it is to maintain the commitment that was signed by the previous Greek government. For the new government, the bailout program was not perceived as sustainable after all the efforts that have been made by Greek citizens since 2010. In other words, starting positions were not consistent but they both have the same type of constraint. Greece didn’t want to exit from the Euro Area and the Eurogroup didn’t want to take the risk of a break in the Euro Area. That was the rules of the game. During the negotiation, the Greek government must be inflexible to show that it has gone as far as it could. It’s important to have support from Greek citizens and from Syriza. For each government of the Eurogroup, a new deal with Greece implied a new vote at the Parliament and the necessity to convince each MP that it was the best solution. So it means that the first step of the negotiation was just to decide of this framework. Nevertheless in this context, an agreement has to be found before February the 28th because after this date Greece will no longer have financial support and will have to exit from the Euro Area. On Tuesday this week, the Greek government has decided to present a framework for a loan extension that will be consistent with a non-official press release that was prepared by the European Commission. In this communique there is room for discussions that are not directly linked to the bailout program. In the game of chicken, the shock between the two negotiators will probably be avoided and Greece by asking for an arrangement which is now acceptable, according to document from the ministry of finance, is probably the chicken. But who cares if the Euro Area can continue without a negative and persistent shock that would be associated with a Grexit. The major point this week was on GDP growth in the Euro Area. There are four groups of countries plus Greece. The first one contains countries where the level of activity is above the pre-crisis level: Germany, Belgium, Austria and France. German growth was +0.7% in the 4th quarter (2.8% AR) and 1.6% in 2014. In France, GDP was up by 0.1% (0.3% AR) in the fourth quarter and 0.4% for 2014. In Belgium growth was +0.1% (0.4% AR) and +1% for 2014 and in Austria numbers were +0.1% (0.4% AR) and 0.3% for 2014. 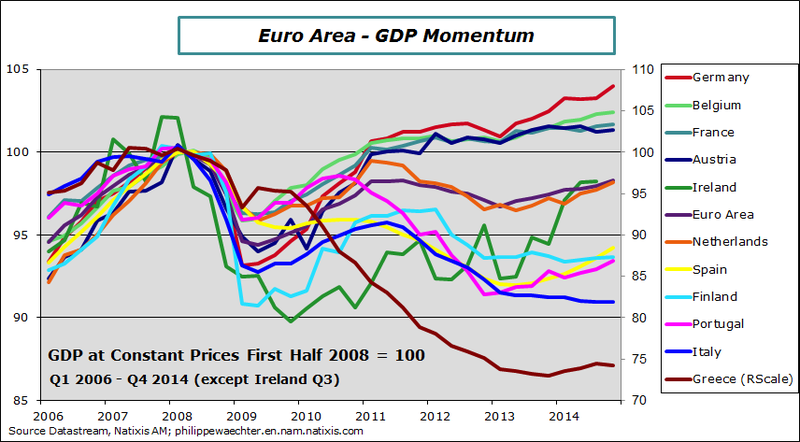 The Euro Area and Netherlands are in a catch-up zone, below the GDP pre-crisis level. In the Netherlands, GDP was up by 0.5% in the last quarter of 2014 (2% AR) and 0.8% for 2014. In Spain and Portugal, the rebound is spectacular. GDP was up 0.7% (2.8%AR) and 0.5% (2% AR) respectively in the fourth quarter and 1.4% and 0.9% for 2014. The Spanish GDP level is now above Finnish GDP regarding the pre-crisis level as a reference. Finland is in its third year of recession. The fourth group is for Italy where GDP growth was 0% in the fourth quarter and -0.4% for 2014. The other important point is what has happened in Sweden where the Central Bank has pushed down its repo rate into negative territory at -0.1%. The Riksbank has explained its move by the long lasting deflation seen in Sweden. Beside this measure and to fight it the Bank has announced that it will purchase government bonds for SEK 10bn. Mark Carney the Bank of England Governor said that interest rates could converge to 0 as the inflation rate will turn negative in 2015. He is persuaded that the next move will be a liftoff but….. A negative inflation rate and weak core inflation can change landmarks. Retail sales were down by -0.8% in the USA in January. A lower gas price is an important explanation of this drop. Ex gasoline, retail sales change was 0%. Without auto sales and gas, core retail sales were up by 0.2%. It’s low but not alarming. May be will it be next Monday? It’s the conclusion we can have after the failure of the negotiation between Greece and its Eurogroup partners (finance ministers of the Euro Area). This non-scheduled meeting was billed as a last chance for a compromise. There will be one more last chance Monday. The most worrying in this meeting is its failure of course but also the lack of capacity to write a communique. One was written but Athens’ government, in a last-minute move, didn’t want to sign it. Everyone agreed on this communique including Yanis Varoufakis the Greek finance minister who was the Greek negotiator. The arm wrestling between the Greek Prime Minister Alexi Tsipras and all the other European governments continue. The negotiation is twofold; one part is on the financial ground between Greece and Europe and it is an important one for Greece and also for the Eurozone survival; the other part of the negotiation is linked to the commitment between the Prime Minister and Greek citizens. To be strong on the European side he needs a strong support from Greek people but to gain and keep domestic support he has to be strong in his negotiation with Europe. There is another issue in the battle: I’m sure that he is persuaded that the Euro zone will not accept a Grexit (Greece exit) because it is too risky for every European country from Germany to Finland. Who really wants to take this risk as we don’t really know what would happen? Tsipras probably imagine that Europe has more to lose than Greece if at the end of the day the negotiation is a real failure. To keep the Euro Area working well, there is a need to find a solution quickly as the deadline is February 28 and repayments for Greece in 2015 are large. On the whole year, Greece will have to repay about EUR 9.8bn to the IMF. The amount is almost homogenous during the year. It will have to repay EUR 6.7bn to the ECB (SMP portfolio). This will be in July and August. There is also a need to roll the short-term position. The government will have to roll EUR 14.5bn (1.4 to 2 per month). These Tbills are in Greek banks’ portfolio. Greece needs to find a solution to avoid a default. This is really urgent as tax receipts are lower than expected and a failure could lead to a bank run. It’s always possible to minimize the impact of a Grexit because of the size of the country. But we can imagine that in the case of a Grexit, the credibility of the Euro Area construction would be at risk. Who would like to take this type of risk? And who, outside Europe, would trust Europe? 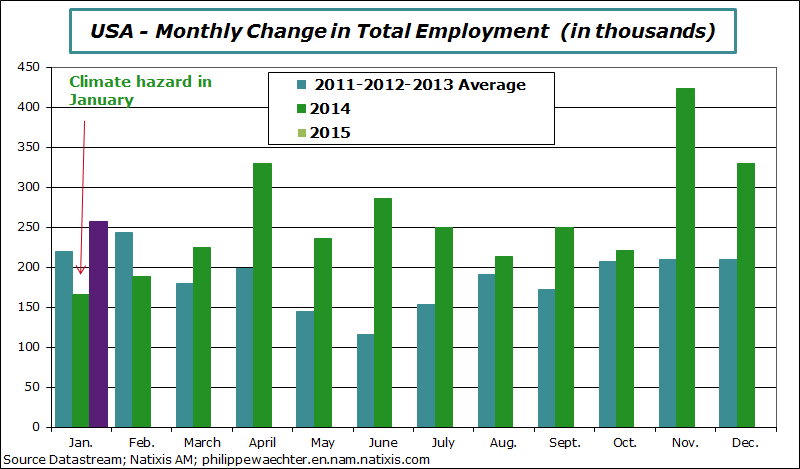 US employment has increased a lot during the last three months. The number of jobs creation was strong in January (+257 000) and the upward revisions in November and December were significant. This can be seen on the graph below. The report was full of details that show a real improvement in the labor market. The first is the change in regime since last April. It continues in January 2015 and reflects stronger numbers since April. The second point is the strong inflow on the labor market from people who were out of the market. This means that the labor market attractiveness has dramatically changed. This is a positive signal. On another point of view the employment rate for people between 25 and 55 years of age is improving rapidly. These people have had a succession of negative shocks. Employment has dropped rapidly in this tranche of age. Step by step they are coming back on the market. The “25-55” employment rate is now at 77.2%. It is still 2.8% below the business cycle peak in January 2008. That’s a situation I was expecting in order to have a real perception that the situation is converging to a more normal trajectory. The fact that people are back to the labor market is the main reason to explain the marginal increase of the unemployment rate. With this in mind, this is a good signal. But the trajectory is still far from its long-term equilibrium and that’s why there are no pressures on wages yet. The average wage rate grows at the reduced pace of 2.2%. The ECB has changed the refinancing conditions for Greek banks. Government bonds and bonds with the government guarantee will not be eligible anymore. The ELA instrument will be available but be more expensive than the usual procedure. PMI indices were almost stable in January for the manufacturing sector in developed countries. Nevertheless, the US ISM dropped for the manufacturing sector; probably the impact of a low oil price. Composite indices in the USA and the Euro Area were stable for the first and improving for the second. Strong improvement in retail sales for the Euro Area in the fourth quarter (strongest since Q4 2006). For the whole year the US inflation rate was just 1.3% for the headline and 1.4% for the core measure. Far from the 2% target for the preferred Fed’s target.